We have a very interesting weather today, full of ice, sleet, snow and rain. All schools are closed and it’s certainly not a great day to plan a long trip, but a great day to post some of those pending stuff and have an extra long Easter Weekend.. My friends in New Zealand are approaching autumn right now. 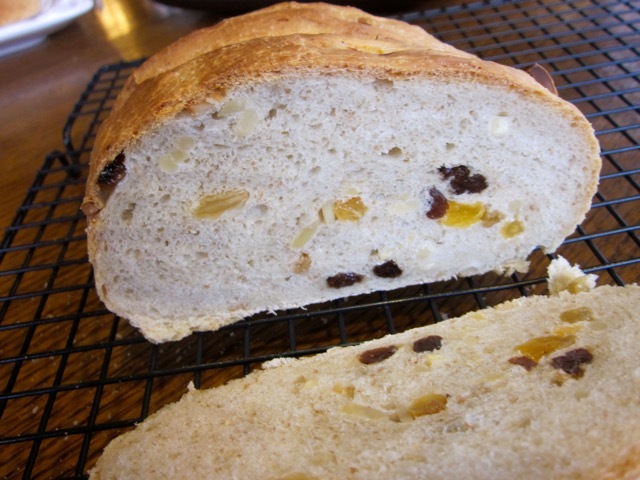 I made this bread many months ago, but I still remember the crunch of the almonds and the sweet, chewy sultanas (golden raisins). I assume most of you will have a long weekend. I wish you a Happy and Peaceful Easter, wherever you will be. and mix into a soft dough (you may need 2-3 tablespoons more water). 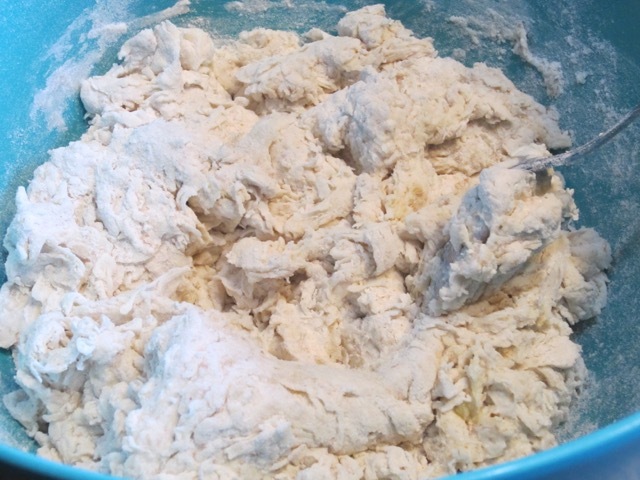 Turn the dough onto a lightly floured surface and knead 10 minutes until smooth and elastic. 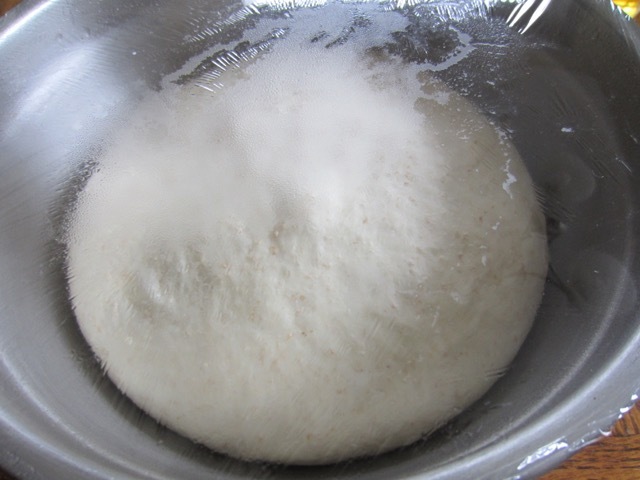 Place the dough in a lightly oiled bowl, cover with cling film (plastic wrap) and leave in a warm place for 1 hour or until doubled in size. 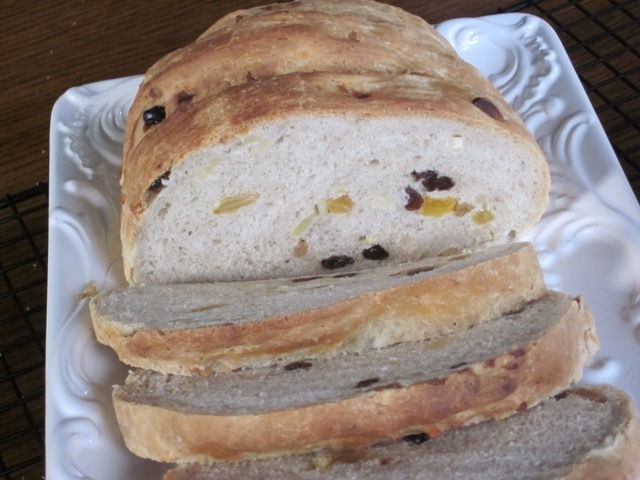 Mix the sultanas with the raisins. 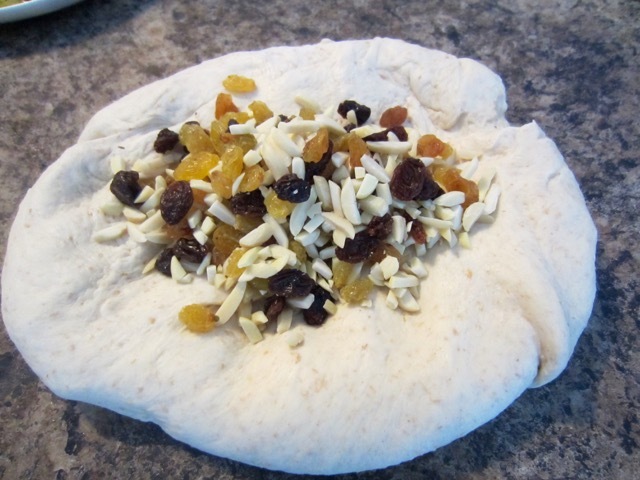 Knock back the dough onto a lightly floured surface and knead in the sultana-almond mixture. then shape into an oval loaf, tucking the ends in place. Place on the prepared baking sheet. 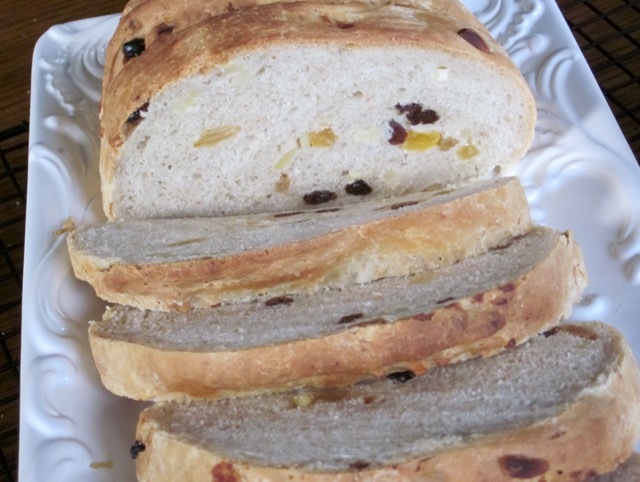 Using a very sharp knife, make deep slashes on the surface of the loaf. Cover the loaf with a lightly oiled cling film or polythene bag and leave in a warm place for 30-45 minutes or until doubled in size. until golden and cooked through. Transfer onto a wire rack to cool. I especially loved the crunch of the almonds. Line a baking sheet with parchment and lightly sprinkle a little cornflour (maize flour). Preheat the oven to 450°F (230°C), 10 minutes before baking. Sift the flours, yeast and salt into a bowl and make a well in the centre. 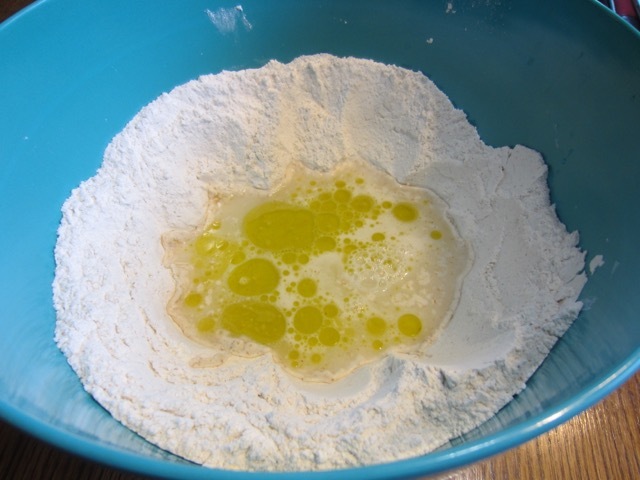 Add the water and olive oil into the well and mix into a soft dough (you may need 2-3 tbsp more water). Turn the dough onto a lightly floured surface and knead 10 minutes until smooth and elastic. Mix the almonds with the sultanas. 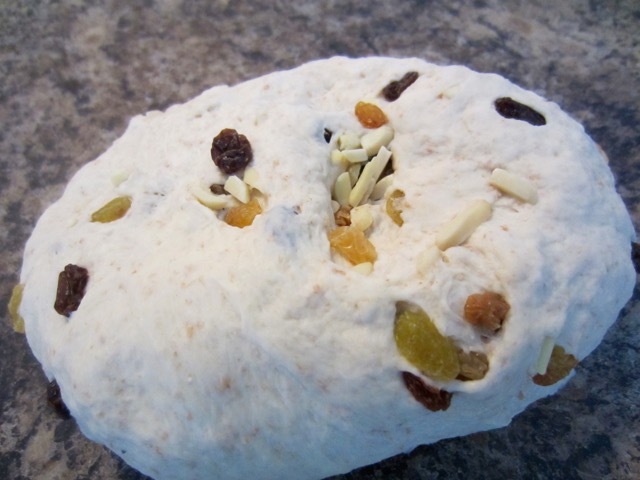 Knock back the dough onto a lightly floured surface and knead in the sultana-almond mixture. Leave the dough to rest for about 5 minutes then shape into an oval loaf, tucking the ends in place. Place on the prepared baking sheet. 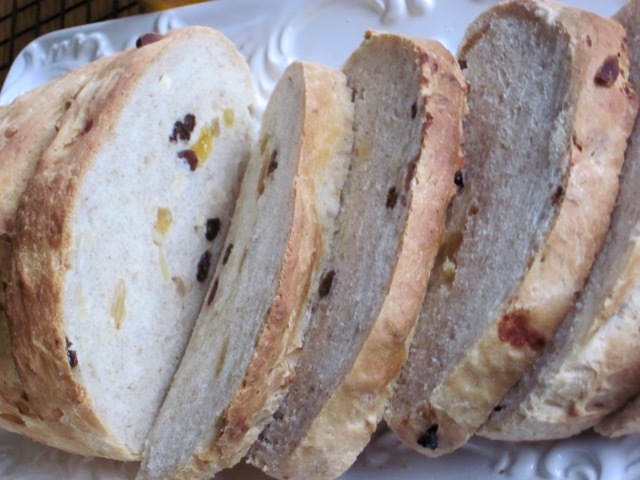 Using a very sharp knife, make deep slashes on the surface of the loaf. 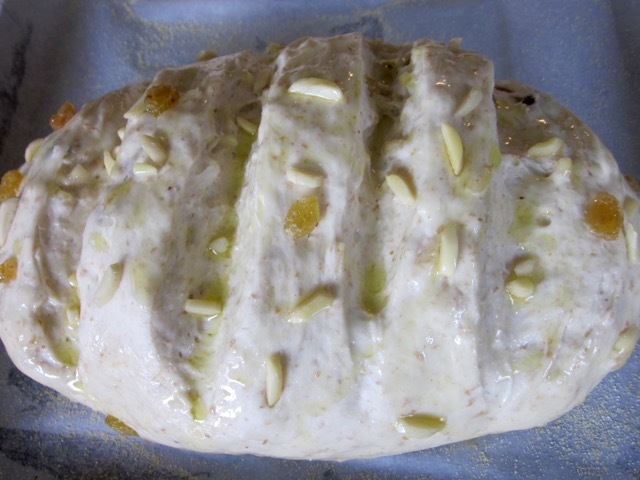 Cover the loaf with a lightly oiled cling film or polythene and leave in a warm place for 30-45 minutes or until doubled in size. Brush the bread liberally, with the extra olive oil. Put in the middle rack of the oven and immediately reduce the temperature to 400ºF (200ºC) and bake 30-35 minutes, until golden and cooked through. Transfer onto a wire rack to cool. Please note that oven temperatures are given as a guideline only. You may need to add or reduce the suggested temperature depending on your oven. I baked the bread at 400ºF (200ºC) convection for 30 minutes. Please note I doubled the recipe and made two breads. I used 700g white and wholewheat flour and 2 cups + 2 tablespoons water (530ml water). 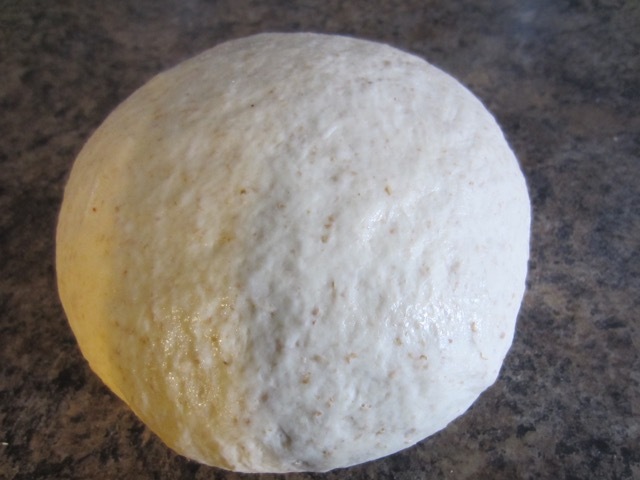 The dough should be soft and elastic. It makes a better bread. I can smell the almonds from here, Liz. I hope you and your family share a wonderful Easter. We had a very wonderful Easter, John, thank you very much! Thank you. Hope you found time to try it. Have a wonderful weekend. Looks incredible! You are braver than me, I am still starting to use the convection setting for my breads and other baking. We also have a Samsung convection oven, ours has the induction cooktop. I convection bake my sourdough because I have instructions for that. It’s adapting all my other recipes I haven’t started yet, over a year since we got it! Thank you. I returned the Samsung oven I bought and got a Frigidaire. It was terrible. I’m finally settling to my normal bake life. I rarely use convection, except for muffins! Did you have to buy new cooking pans for induction? Enjoy the weekend. Tomorrow is gonna be awesome after a wet, sleety day. I look forward to! Your kitchen must smell just lovely all the time! 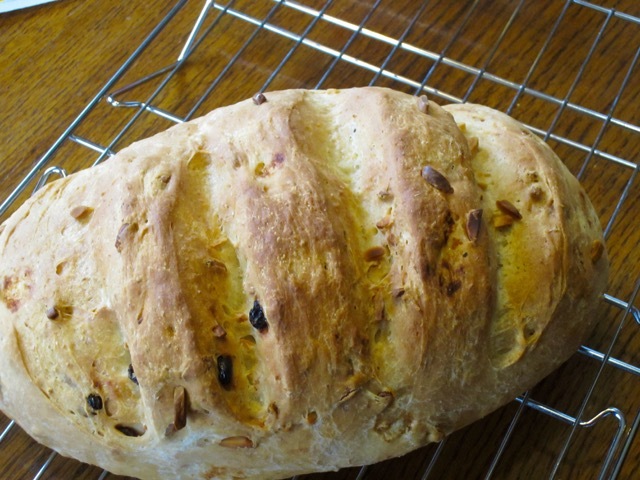 Wonderful looking bread! And thanks for posting about the convection baking tip! I have a convection setting on my oven and honestly, I rarely use it. I can understand about the bread being dry on top. Some things just need to be baked the old fashioned way! Hope you get to rest a little over the Easter weekend with your family. Happy Easter Liz! Talk about convection cooking. I only use it for muffins, period. I’ve been cooking the whole day long and eating non-stop. mostly junk. What a terrible day. I have just finished some nice roasted butternut squash risotto. So good I tell you. I hope tomorrow I’ll get back to my usual healthy eating habits! Easter was good! Take care gal!! !